"The 207 Squadron bomber crew whose short history is traced in this story failed to complete their sixth operational flight on the night of 24/25 July 1944. THEIR SORTIE WAS NOT COMPLETED. Our research into these young men has been quite difficult. All we had at the outset was a letter sent to my late mother over fifty years ago and the knowledge that it referred to a young man called Ross who had been killed in an aircraft during the war. From these very unpromising beginnings we have managed to slowly piece together not only his story but also that of those who served with him. 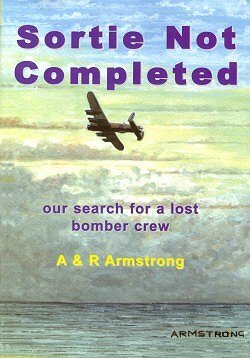 Unlike the aircrew, our sortie is completed and the story of everything we have found can be read on the following pages. This work is dedicated to the men and women of Bomber Command 1939 -1945." A & R Armstrong, 37 Crosshill Drive, Morton West, Carlisle CA2 6RS: £3.99 + P&P. Please ensure your remittance is either in Sterling or covers all bank/currency charges, so as not to leave the Armstrongs out of pocket!